Thank you so much! I so appreciate that! I’d be honored! Thank you kindly! Thanks Kerfe. Working on improving my cats. They’re tricky but fun. Yes, I should get back to them. Although my neighbor’s cat is indoors for the winter, so no model instantly available! Do you ever draw from photos? I know it’s not as technically accurate, but … I wouldn’t be drawing animals otherwise right now (my kitties have passed). When they were alive, unless they were sleeping, it was pretty tough! Oh I draw from photos all the time. I did a bunch of endangered species cats at one time…long ago now it seems. No real leopards or tigers around here! That is a beautiful sketch Laura, and yes I note your promise here. Pingback: Shyna, Lovely Kitty (#39): 100 Face Challenge – Lukecats. About cats and life. Wow Laura, I am impressed 🙂 You have skills! I’d like to print this one and hang it on my wall in a frame, because it’s a beautiful drawing, and well, of course also because it’s Shyna! 🙂 Also I wonder if you will allow me to download your image to upload it to my blog, I’d like to attach it to a post that I will write about your work. I’d like to mention both, the main URL of your blog, and the URL of this post. Let me know if I am allowed to do that. Thanks a lot for drawing Shyna, also it’s very interesting to see how one of my photos looks like if it’s drawn with graphite! I’m so glad you like it, Dennis, and so honored that you’d like to feature this drawing on your blog. I was pressed for time both in the drawing, which I did late at night, and in the post, which I wrote in the middle of a busy workday. I should have explained that I consider this a preliminary sketch. The only other I’d tried of Shyna was hastily scribbled on a Post-it note. This was done in my most humble sketchbook, not the best of paper, because I wasn’t sure how it would turn out. It went a little better than I expected but I can’t get the depth I’d like with that paper and I didn’t take the time to finish it properly. I just couldn’t resist your photo (which had me grabbing a Post-it at my desk right away – that’s how much I loved it). So when I had a chance at bedtime, I had to grab that image again and have a go. So, to make a long story short, as flattered as I am by your appreciation for this drawing, I’d like to do something much better! If that makes any sense. I consider this a preliminary sketch. Again, I couldn’t be more thrilled that you’re pleased with it, Dennis! Even if I am not an illustrator, I know what you mean. In photography for example, I call the majority of my photos just “snapshots” (probably similar to sketches), shots taken for practicing or to see how it turns out, or photos just taken out of boredome. I learn and experiment with angles, backgrounds, lights, different subjects and so on. I take that experience and try it better, or I do other snapshot experiments to see how things turn out, and the experience will be helpful for the future. I always try to improve myself, and that is only possible if I take lots of photos. But then, sometimes, I am so happy with a photo that I want to make it shine with Photoshop or Lightroom, or I go to great lenghts to try to get the exact same shot done under better conditions (less distracting things in the background, better focus on the subject, better sunlight or daytime). I think this is the point with many creative interests, you learn by just doing it, that’s practicing, and you always want to do it better. Thank you so much! From one artist to another, I really appreciate what you’re saying here, and I’m gratified that you enjoy my work as well. Dennis, would you mind sending an email to me at createarteveryday@comcast.net so we can discuss? Wonderful, and those eyes, slitted into focus…it sees a mouse, I tell you! Thanks so much, Johanna! Nothing better than the intent focus of a cat. I wouldn’t wanna be a mouse within Shyna’s reach! Charley and I would be honored! Thank you, Charlie! That’s an interesting point you raise. Maybe it’s the distance and the multiple angles/points in a cityscape that makes it more complex for me? It’s kind of weird to think that someone could draw buildings for years with perfect precision and struggle with an animal because they’ve never tried animals. Or the reverse. Interesting! I chose this photo because of the perspective and thought it would be a real challenge. I struggled with Shyna’s left snout, but not the eyes, which is strange when I think about it. I feel like you do really well with whatever subject you tackle, Charlie. Not sure if that helps, but as the viewer, I don’t really see an issue in your work, especially considering the speed at which you produce it and the fact you consider them sketches/doodlewashes. Imagine what you could do if you had the time to really put into a detailed work. Although I understand the whole art-ADD thing as well, but seriously, I don’t think there’s any subject you couldn’t really master in no time at all. Even cats! lol. Have you decided on your C piece yet? Thanks so much, seagroves! 😀 So glad you enjoyed it! Awww, thanks so much, Sharon! I want to give you a hug for your kind encouragement and help to a baby artist. Have a wonderful weekend, my friend. Laura! This took my breath away! WOWZA! I had to tell myself – breathe – take a breath – LOL! SO STUNNING! Oh those eyes. I feel the love – of Shyna for Dennis – of you for cats – of you for art! ❤ Swoon! Jade, you are too kind! Thank you so much! Doesn’t she look so intent? I wonder what she is staring at. I just loved this photo. And I just want to add….you’re extremely talented too! Thanks so much, Teri! I had a wonderful reference to work with. Truly a delight. So glad you enjoyed it! Thanks so much, Jean! Meow! Beautiful sketch! I’m especially impressed with how you captured the beauty and curiosity of her eyes. Well done! Thank you so much, Trisha! The eyes are what draw me in to a photo every single time. I would really enjoy a detailed drawing of the eyes alone. I have often thought I might try it, most likely in colored pencil, I think would be fun. I’m so glad you enjoyed this sketch, and I really appreciate your kind encouragement here and at Dennis’s place. Have a wonderful weekend, and I hope you do try sketching if you enjoy it. It is such a meditative and relaxing hobby, which is what drew me to it (no pun intended lol). Thank you, Nia, you are too kind! I really appreciate your comments both here and at Dennis’s blog. I’m humbled. Thanks again. This kitty is so realistic and detailed, and the fur looks awesome! Have a terrific weekend!! Thanks so much, Carol! I hope to do a more detailed sketch on better paper. This cat is irresistible, and Dennis’s photos are amazing. If you have time, I think you’d enjoy his photography. He is also a most kind man. Thanks again for your sweet comment. Thanks, Jill! Sorry I had a brain miss there and somehow neglected to reply til just now. I do want to sketch Jack, very much. He will be a challenge, but he will be worth it. He so reminds me of our Prancer. I’m really glad you like this sketch. More cats planned soon! They are much harder than dogs, I think, but I’m enjoying faces of all kinds. I agree. I think drawing a face every day is helping. Some are harder than others. One day I will draw them too – I love the book you recommended! I’m so glad!! She is such a good teacher! What a lovely drawing 🙂 I came here from Dennis’ post and must agree with him, it’s a great sketch! Thank you so much, Solveig; that really means a lot that you took the time to come over here and let me know that. I really would love to become a pet portraitist and I’m working hard to perfect my skills. I still feel I have a ways to go, but photos like Dennis’s just beg to be drawn! Thanks so kindly for your comment and I hope you have a wonderful weekend! Thanks so much, Susan! That photo was just something I couldn’t resist! That sweet face! Me too, Teresa, I love cats so much (and still miss my two who’ve passed). They are harder to draw than dogs, though. At least, for me, right now. But it’s good to keep practicing them. I’m so glad you like it! I think you’ve found your niche (or one of them) with these animal faces – they’re wonderful! Lin, I so appreciate your comment. I really admire your work very much and I feel I’ve found my space here too, and after long searching, so … thank you for confirming my gut instincts. Coming from you, again, it means a lot! Thanks! Lovely study… & gorgeous cat! Isn’t she beautiful? I’m so glad you enjoyed it, Nexi! You’re coming along. Good observation of the fur around the eye. Thanks so much, Maggie! I’m working on them, trying to get better…..this one really was supposed to be a preliminary sketch that I hope to perfect on good paper and with more time spent. I’m glad you’re seeing improvement, that means a lot. This is beautiful Laura. I could gaze at this kitty drawing all day. You and your pointy pencil made magic! Cathe, thank you for making my night with your kind remark! I am trying so hard to improve. I really want to be able to make the owners of these animals proud and happy with the work I’m doing. We lost both our cats within a year and a half and it makes me so happy to draw others’ pets now. I’m really enjoying it. And the people faces too. It’s just feeling like…..I finally found what I’m supposed to do. Thank you. Beautiful drawing Laura, with a real capture of the cats soul. Oh this is just wonderful Laura! What a beautiful cat. I can only echo what’s already been said on the perspective – I can see how that would have been quite tough to nail, but you got it spot on the money! Lovely attention to detail in the fur, too. I bet even Shyna herself would approve of this! Another great animal portrait Laura! 100 face challenge sounds interesting. Thanks so much, Mary! I’m hoping it turns into the 365 face challenge, honestly. I’ve already made it to 40 because I can’t seem to not draw faces, apparently. hehe. And since we’re not 40 days into the year, I figure I can go for 365. I’m glad you are enjoying it! I sure do love what you do. You have the Midas touch! Iris you’re so sweet. Thank you! 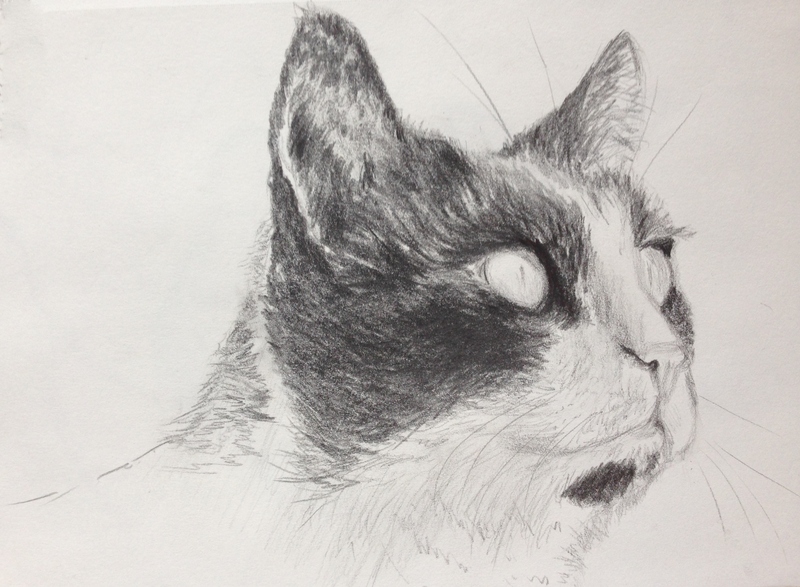 Beautiful graphite drawing you captured the essence of the cat.. They are my favorite creatures you know! Mine too, Jennifer! Thank you, I’m so glad you like this one. This is one beautiful cat and Dennis has a ton of great photos of her. It really helps to have a great reference. Love cats! Yes indeed! Your pencil work is spot on! Wonderful :-)! Your graphite cat portraits are so life-like! Oh my! Mega-blush :-). Thanks for the awesome compliment. Your cats deserve huuuuuuuge compliments! That is so stunning that I had to tweet about it! Aww thanks so much, Margaret! I’m so glad you enjoyed it! How kind of you to do that! Much appreciated!